Making homemade pasta from scratch is easier than you think. 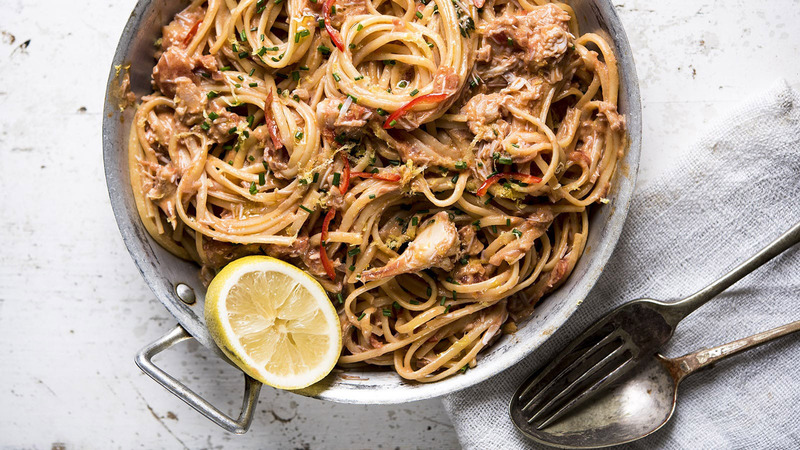 Here, classically trained chef Issac Carew shares his top tips for making fresh pasta at home, as well as a delicious recipe for crab linguine. Pasta is such a versatile ingredient, forming the basis of so many delicious dishes, from a simple pasta and pesto dish to delicately stuffed ravioli. Fresh, homemade pasta beats anything that can be bought in the supermarket, but making pasta from scratch can seem daunting. 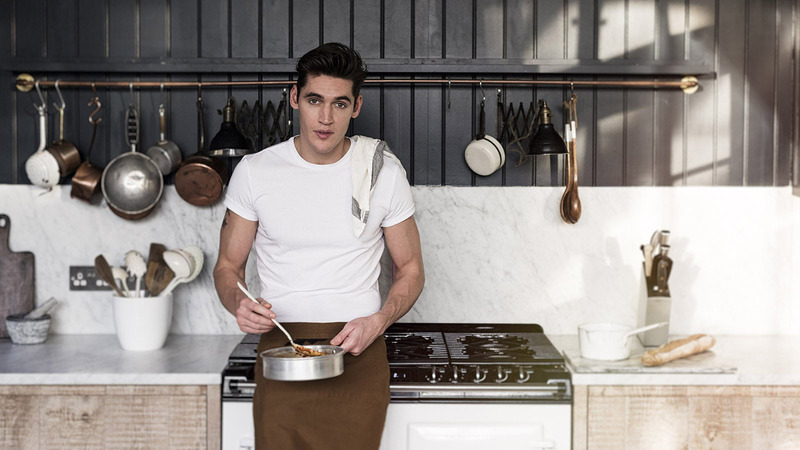 Here, classically trained chef and model Issac Carew lets us in on his top tips for how to make pasta at home and shares a delicious recipe for crab linguine. It wasn’t until I was eighteen that I started making pasta. I’d been working for Angela Hartnett for three months and I was put on the pasta section. And that was that: I fell in love with using such a simple base ingredient to create a huge range of dishes. People always say to me that making pasta is too hard and time-consuming, needing lots of fancy equipment, but it’s actually really easy and cheap. It’s my mission to convert people to making pasta from scratch as it makes such a huge difference to the taste, is really cost-effective and, once you get the hang of it, very relaxing to whip up. Pour the flour into a pile on a clean work surface. Using your fingers, make a well in the top of the pile. Whisk the egg yolks and whole eggs in a bowl, pouring in the olive oil as you go. Pour the egg mixture into the well in the flour, mixing together with a fork or your fingertips until you reach a light, breadcrumb-like texture. Continue to bring the dough together. Knead for a few minutes to strengthen the gluten – it should become smooth, silky and slightly shiny. Once you’ve kneaded the pasta dough, wrap it in cling film and immediately place in the fridge. Leave to rest for at least 30 minutes. 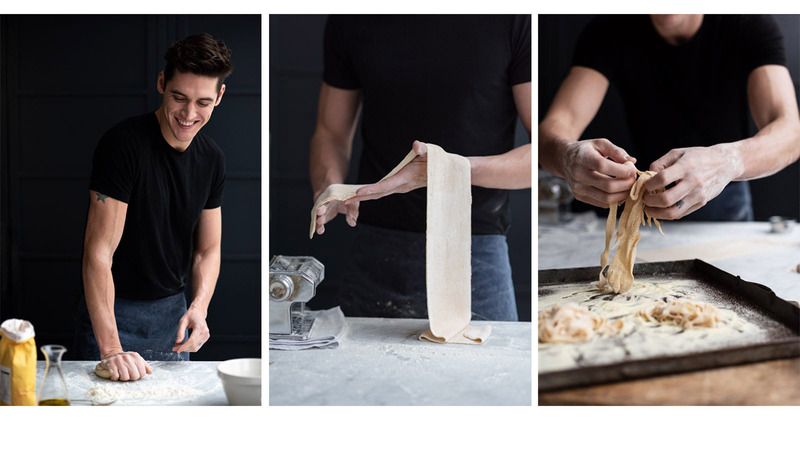 Once the dough has rested, cut it in half and flatten each half with a rolling pin, until you have an almost rectangle shape, the same width as the pasta machine. Set your pasta machine to its widest setting. Flour your pasta dough and roll it through the machine twice. Then roll the pasta once through each of the settings, working your way down to the second-from-thinnest setting (or the thinnest setting if you want seriously thin pasta). Cut your pasta into the required shape and either use straight away, or dust in semolina flour and hang so it dries out. Dried fresh pasta usually keeps for a week or two. Crab is quite an underused ingredient. I think a lot of people try brown crab meat first and don’t like it, or find a whole crab a daunting challenge. But it’s actually very easy to cook and the combination of crab and chilli creates a clean-tasting but fiery dish. I nearly always choose linguine over spaghetti – sauces cling to linguine easily and you get more from every mouthful. Whack a saucepan of salted water on to boil. In the meantime, heat a medium frying pan over a low to medium heat, add a little olive oil and sauté the shallot and garlic until sweet and tender. Add the chilli to the pan, along with the thyme leaves and cook for a few minutes. Next, add the white wine and cook over a medium heat for another minute or two until the sauce is reduced. Finally, add the chopped tomatoes and simmer for 5 minutes. Chuck the linguine in the salted boiling water and cook until al dente. Retaining 1–1½ ladles of the pasta water, strain the pasta and set aside. Add the crab meat and mascarpone to the sauce, then fold the sauce through the pasta, adding the reserved water. This will give extra gloss to the dish and a deeper taste. Finish with a little drizzle of olive oil, the lemon juice and a sprinkling of chives. The Dirty Dishes is classically trained chef Issac Carew’s debut cookbook, full of the fun, delicious food that serves as his cooking inspiration. With one hundred recipes, from ideas for lazy brunches to late-night bites, and plenty of dishes that celebrate his love of pasta, this is the perfect kitchen companion for those who like to get a bit messy in the kitchen and have fun with cooking.